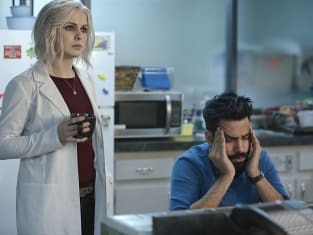 On iZombie Season 2 Episode 12, Detective Babineaux teamed up with Liv to look into a triple homicide. It was a case that left our heroine stunned to learn that the victims' bodies were missing their heads. From there, a ravenous Liv was forced to consume the brain of an unfortunate social media hungry soul who had recently been run over by a bus. OUCH! Meanwhile, Peyton (guest star Aly Michalka) leaned on Ravi for support... things get quite interesting when Blaine's worlds started to collide. You can find out when you watch iZombie online via the video above. Sit back and enjoy!